Today I found out the origin of pretzels. A common origin story of pretzels is that they were created by a monk around 610 in Italy. According to The History of Science and Technology, the monk baked strips of dough that he folded into a shape resembling a child crossing its arms in prayer. He would give these treats, which he called “pretiolas” or “little rewards,” to children who had memorized their prayers. Unfortunately- and not surprisingly- there’s no documented evidence from the 600s to confirm this story. Other similar stories star a monk from France and bakers held hostage in Germany. While any one of these stories might have some modicum of merit, what we do know for certain is that the earliest recorded evidence of pretzels appeared in the crest of German bakers’ guilds in 1111. Later, in 1185, an illustration of pretzels appeared in the Hortus Delicarum. The manuscript was compiled by Herrad of Landsberg at an abbey in Alsace, then a region of Germany. However, it’s very likely that pretzels existed long before either of these instances. In a prayer book used by Catherine of Cleves in 1440, there was a picture of St. Bartholomew surrounded by pretzels. By this time, pretzels were considered a sign of good luck and spiritual wholeness—possibly due to the three holes in the common pretzel shape touted to represent the Holy Trinity at this point. The “good luck” connotation carried the pretzel to other holidays, including New Year’s Day, when in Germany children hung pretzels around their necks; pretzels hung on Christmas trees in Austria in the 16th century; and parents hid little pretzels on Easter for children to find, an early version of an Easter egg hunt. In Switzerland, the pretzel shape was used as a marriage knot, and couples would each pull on a side of the pretzel on their wedding day. The larger half brought prosperity to the marriage—it was kind of like a doughy wishbone tradition. Pretzels have long been integrated into the Christian faith. By the 16th century, it had become tradition to eat pretzels on Good Friday in Germany, and Catholics once considered them the “official food of lent.” Earlier laws of the Church stated that only one meal a day was to be eaten during lent and the food couldn’t come from an animal. Yet another origin story says that pretzels were developed as a food for lent. Whether or not this is true, pretzels did become a popular staple during the holiday because it was easy to make and fulfilled the Church’s guidelines. Pretzels made their way across the Atlantic with German immigrants who were later to be known as the Pennsylvania Dutch in the 1700s. Many pretzel bakeries popped up in Pennsylvania around this time, and Pennsylvania continued to be the seat of American pretzel production and consumption; around 80% of pretzels made in America are made in Pennsylvania today. While it’s estimated that Americans eat two pounds of pretzels in a year, pretzel consumption in Philadelphia is estimated to be around twelve pounds of pretzels per person per year. 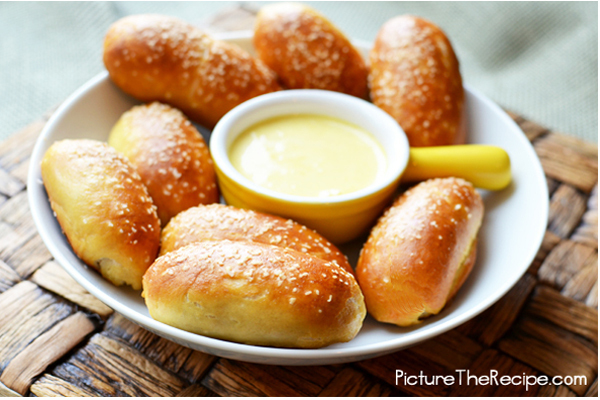 Early pretzels were of the “soft” variety; hard pretzels are something of a relatively modern invention. However, contrary to popular belief, hard pretzels did not originate in 1600 when a baker fell asleep while he was tending his fire, burning pretzels to a crisp, as good of a story as that might have been. In 1861, Julius Sturgis created the first commercial pretzel bakery in Lititz, Pennsylvania. It’s believed that his factory was the first to develop hard pretzels. These crunchy, salty snacks lasted longer in an air tight environment than soft pretzels did, allowing them to be sold in stores far away from the bakery and kept on shelves much longer. These attributes allowed their popularity to spread rapidly and hard pretzels are now one of the best-selling salty snacks in America, sandwiched between potato chips and popcorn. Soft pretzels continue to be a popular snack item as well with push-cart pretzel vendors prevalent in Philadelphia and New York. The push-carts follow a long tradition of pretzel street vendors—it’s believed that they first started appearing in the mid-1400s. Pretzel vendors also provided one of the first confirmed types of food delivery service, as they would go door to door selling their baked goods. 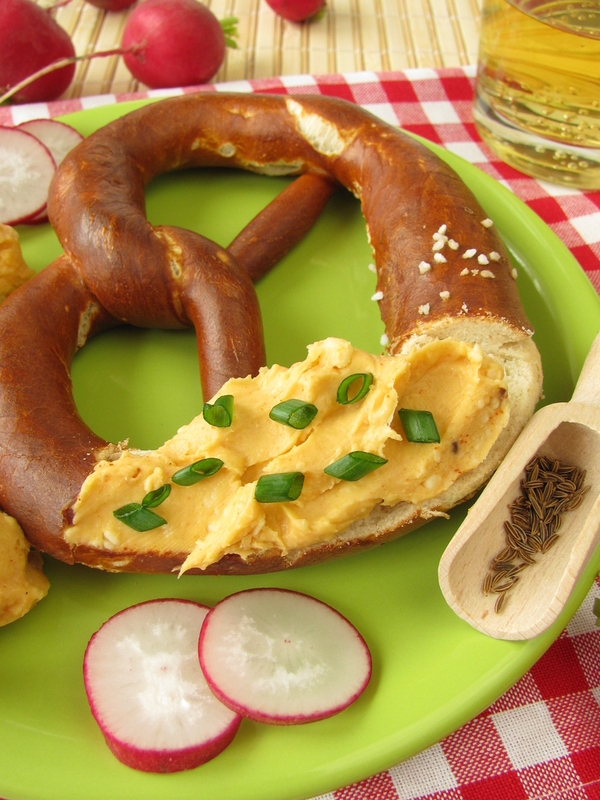 Today, pretzels are most popular in American and in Germany, where they are featured at Oktoberfest. In America, besides covered in salt, hard pretzels commonly come dipped in chocolate or yoghurt, while soft pretzels are served with mustard or liquid cheese. Different flavours are available all over the world, featuring nuts, seeds, and glazes—a long way from the simple dough pretzels that were commonly served religious purposes so many years ago. The Hortus Delicarum is considered to be the first encyclopedia written by a woman. Unfortunately, the original manuscript was destroyed during the Siege of Strasbourg in 1870. Parts of it had been copied into other sources, which meant that a partial reconstruction was possible. To give pretzels the shiny “crust,” pretzel dough is boiled for 30-60 seconds before it’s baked, and an egg wash is typically used. A similar technique is used in the preparation of bagels. April 26 is National Pretzel Day. The day was declared by then-Pennsylvania Governor Ed Rendell in 2003. The largest ever pretzel was 40 pounds, baked by Philadelphia resident Joe Nacchio. The baked good was 5 feet across. An article about pretzels isn’t complete without mentioning Seinfeld’s Kramer making his famous exclamation, “These pretzels are making me thirsty!” In the episode, The Alternate Side, which aired in 1991, each of the main characters says the line at least once. Always love a good pretzel. め is a letter from japanese. Its pronounced like “me” as in melon.